In a large bowl, cover the rice with cold water. Using your hand, agitate the rice to release the starch, then carefully pour off the water. Rinse the rice 5 to 7 more times, until the water runs clear. Cover the rice with water, add 2 teaspoons of salt and soak for 30 minutes; drain. Meanwhile, preheat the oven to 350°. Spread the linguine on a large rimmed baking sheet and toast for 8 to 10 minutes, until well browned. Let cool. Fill a 5-quart nonstick Dutch oven half full with water, bring to a boil and add 2 tablespoons of salt. Add the noodles and boil over high heat until barely softened, about 2 minutes. Add the rice to the Dutch oven and boil until it is al dente and just starts to soften; this can take from 3 to 8 minutes, depending on your rice (do not overcook it). Drain well. Put the oil and 1/4 cup of water in the bottom of the Dutch oven. Drizzle 2 tablespoons of the brewed saffron on top. Gently scatter one-quarter of the noodle rice into the pot (you want it to stay fluffy) and season with salt. Sprinkle with one-third of the coriander and cardamom. Repeat with the remaining noodle rice, coriander and cardamom, ending with a layer of noodle rice. Cover the pot and set it over moderately high heat until it starts to steam, about 5 minutes. Uncover the noodle rice and drizzle with the remaining 2 tablespoons of brewed saffron and 1/4 cup boiling water. Scatter 6 tablespoons of the butter on top. Cover the pot with parchment paper, then cover tightly with the lid. Cook on a heat diffuser (if you have one) over moderately low heat until tender and very fragrant, about 45 minutes. Meanwhile, in a large nonstick skillet, melt the remaining 2 tablespoons of butter over moderate heat. Add the dates, raisins, clementine juice and a generous pinch of salt and cook, stirring, until the fruit is softened and plumped, about 5 minutes. Keep warm. Spoon the noodle rice onto a platter. Invert the tahdig onto a work surface and, using a spatula, crack it into pieces. Drizzle the rice with brewed saffron and pour the dates and raisins on top. 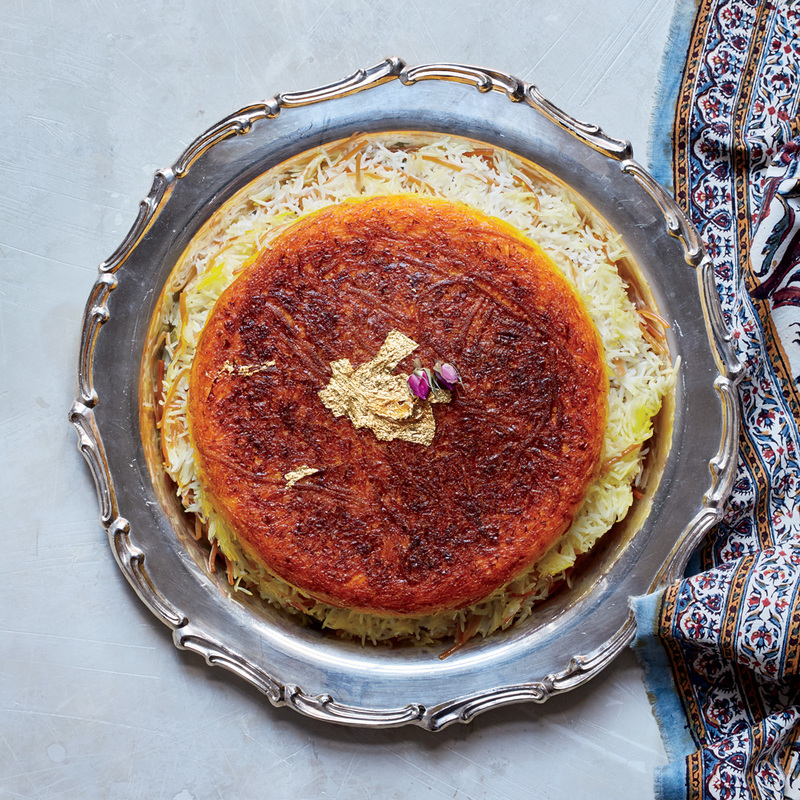 Serve with the tahdig. Garnish with the slivered pistachios and gold leaf and rose petals, if using.